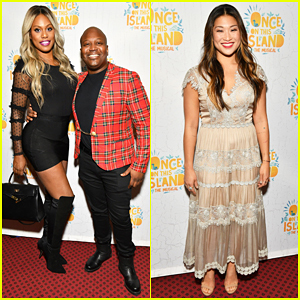 Laverne Cox is all smiles while posing alongside Tituss Burgess on the red carpet of the Once On This Island: Broadway Opening Night Celebration held at Circle in the Square Theatre on Sunday (December 3) in New York City. The 45-year-old Orange Is The New Black star and the 38-year-old Unbreakable Kimmy Schmidt star were also joined by Jenna Ushkowitz, Jordan Fisher, Clay Aiken, Kathryn Gallagher, Krysta Rodriguez, Billy Porter, Phylicia Rashad and the stars of the musical Alex Newell, Kenita R. Miller, Merle Dandridge, Hailey Kilgore, Lea Salonga and Quentin Earl Darrington. Once On This Island is written by the Tony Award-winning team Lynn Ahrens (Book and Lyrics) and Stephen Flaherty (Music), and is the tale of Ti Moune, a fearless peasant girl who falls in love with a wealthy boy from the other side of the island. When their divided cultures keep them apart, Ti Moune is guided by the powerful island gods, Erzulie, Asaka, Papa Ge, and Agwe, on a remarkable quest to reunite with the man who has captured her heart. So proud of my friend Miss @thealexnewell who made their Broadway debut in #OnceOnThisIsland tonight. Alex sang so fiercely that the entire show stopped to bestow a standing ovation after Alex's solo. The entire show was incredibly, inventive, moving and inspiring. Congratulations to the entire cast and crew. See this show if you are in NYC. Helen Mirren brought a touch of gold to the 2017 Stuttering Association for the Young (SAY) Gala. The 71-year-old actress hosted the event alongside fellow actress Kelli O’Hara (right) at NYU Skirball Center on Monday (May 22) in New York City. Also in attendance was Krysta Rodriguez (left). The gala was held to honor film director Jeffrey Blitz and football coach Joe Moglia. Helen has also recently voiced her support for another powerful issue – feminism. 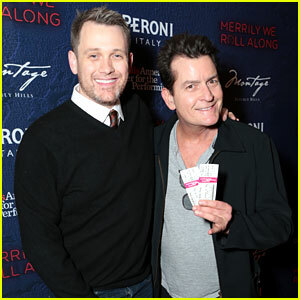 Charlie Sheen Supports Former Co-Star Michael Arden at 'Merrily' Opening in LA! One of Stephen Sondheim‘s most beloved and ill-fated musicals, Merrily We Roll Along, is currently playing a spectacular production in Los Angeles and stars stepped out for the opening night performance on Wednesday (November 30). Charlie Sheen was in attendance to support the musical’s director Michael Arden, who starred alongside him on FX’s Anger Management. Charlie‘s former Two and a Half Men co-star Jon Cryer was also there! Jason Alexander was in the original Broadway cast and he attended the show to check out the new version. 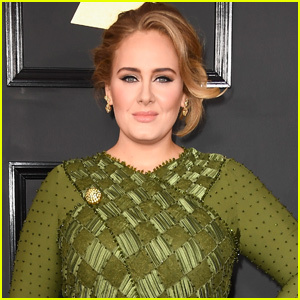 Other stars there included Jesse Tyler Ferguson, Angela Lansbury, Shadowhunters star Katherine McNamera, Elizabeth Gillies, and Broadway talent Steve Kazee, Barrett Foa, Carly Hughes, and Krysta Rodriguez. Get your tickets now to see Merrily We Roll Along at the Wallis Center for the Performing Arts before the limited engagement ends on December 18. Demi Moore & Elizabeth Banks Join Star-Studded Crowd at 'Hedwig' Opening Night in LA! Demi Moore and Elizabeth Banks walk the pink carpet while attending the opening night of the touring production of Hedwig and the Angry Inch at the Pantages Theatre on Wednesday (November 2) in Hollywood. There was a star-studded crowd at the show to witness Darren Criss‘ performance live in person. Also stepping out for the show were Taylor Lautner, Judy Greer, John Stamos, Olesya Rulin, Vanessa Lengies, Vincent Rodriguez III, Riker Lynch, Courtney Love, Margaret Cho, Gia Coppola, Krysta Rodriguez, Mae Whitman, and Demi‘s daughters Tallulah and Scout Willis. Make sure to catch Hedwig at the Pantages, now through November 27! FYI: Taylor is wearing a Ted Baker London jacket and sweater. 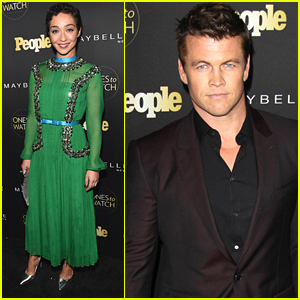 Ruth Negga looks so gorgeous in green at People’s “Ones to Watch” Party held at E.P. & L.P. on Thursday (October 13) in Hollywood. 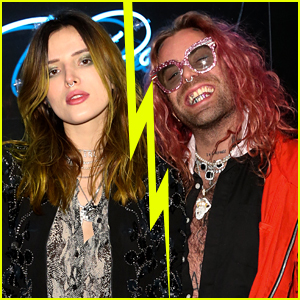 The Loving actress joined a hunky Luke Hemsworth at the party, as well as Daya, Elizabeth Henstridge, Georgie Flores, Krysta Rodriguez, Beau Mirchoff, Nolan Gould, Chrissy Metz, Ali Landry, Garcelle Beauvais, Max and Charlie Carver. Dancing With The Stars pros Peta Murgatroyd, Allison Holker, Artem Chigvintsev, and Sharna Burgess also stepped out for the party.